Also known as book jacket, dust cover, or dust wrapper, a dust jacket is a protective and decorative cover for a book that is usually made with paper and wraps around the binding of a book. The dust cover has folded flaps to cradle the book, those flaps often contain a summary of the book, a blurb about the author of the book, and something features illustrations or text excerpts from the book. The dust jacket first appeared in the early 1800's as a way to protect the bindings of a book and to keep it clean from dust or other damage. As most readers threw the plain jackets into the trash, early dust jacket examples are rare and quite collectible. Later in the 1920's, covers became more decorative and highly prized due to the illustrations or book award seals, and more readers kept the dust jackets on their books. Original dust jackets in good condition greatly increases the value of a modern first edition. 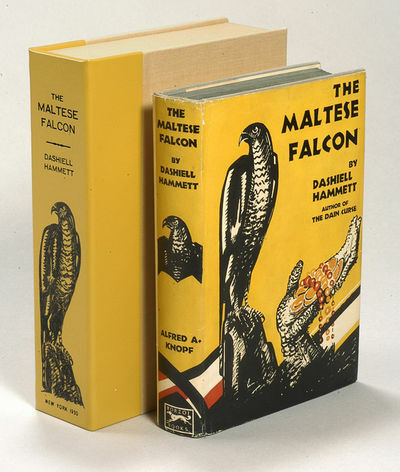 The Maltese Falcon by Dashiel Hammett is a good example of a book that is priced much differently with an original jacket - around a $100,00 difference!